This year is all about saving money every day while trying to increase your income potential. If you did one thing each day that could save as little as $5 over the course of a year, you could have an extra $1800 in your pocket at the end of the year. Not all of these tips may apply to you, so to keep it fair, not all of them will apply to me. I’ve spent the last (almost) five years of married life cooking the meals I know, with boneless, skinless, chicken breasts. Cryovac’d Foster Farms chicken from Costco at $2.99/lb. is a real bargain. I was watching an episode of the Bank of Mom and Dad on Hulu, and the debt debilitated couple was learning how to cook for themselves so they wouldn’t eat out so much. I wish I could have a four star chef teach me how to cook, but I guess since my credit card debt is just barely into five digits I didn’t screw up badly enough. What caught my attention was that every meal used chicken thighs. A little note even popped up on the screen informing me that boneless, skinless, chicken thighs are an inexpensive alternative to boneless, skinless, chicken breasts. He responded, “I’ve always liked dark meat anyway.” Insert “D’oh!” with Homer-size head smack. It is easiest to subsititute when you’re using a heavier sauce or in soups and stews. Then even white meat enthusiasts can’t usually tell the difference. 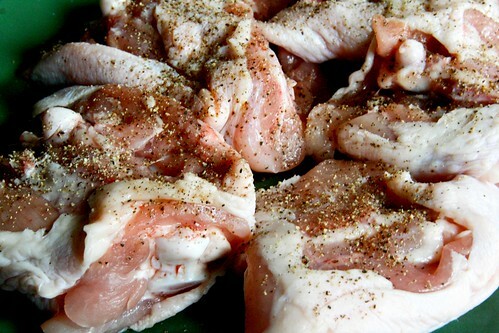 You'll find the boneless, skinless thighs more flavorful than the breast meat. I learned this substitution in Weight Watchers. @Bucksome: You are correct. We had chicken thighs tonight and I really didn't have to do anything to them. I didn't know Weight Watchers encouraged this, but cheers to them.